Musicians Gwyneth and Monko met in just 2009, when Gwyneth Moreland was looking for somebody to back her while she toured for her solo album. They quickly took to one another, finding a home in a rock sound with a rootsy, stripped down feel. So far their career as a duo has been overwhelmingly spent on the road, but it seems to work extremely well for them creatively. Their new, self-titled album was matured and perfected over months of touring to promote their debut EP. 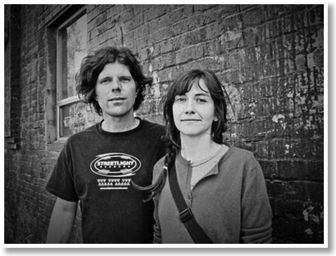 In their music, Gwyneth and Michael Monko both reveal their individually Californian roots, reflecting a blend of American folk and bluegrass by way of rock. The tunes seem to follow an adapted formula of narrative not unlike one Bob Dylan found success with, and the pair says they have experimented and brought a more complex instrumentation to the album than was on their EP. 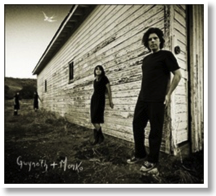 In the midst of their constant stream of shows, Gwyneth & Monko took the time to answer some questions on their roots, their hopes, and their music’s role on the U.S. music scene. Marie Meyers: How have you both grown through the search for the perfect musical partnership and have you surprised yourself in any partnerships along the way? Gwyneth Moreland: We have both grown as musicians in the last few years just from the shear daily practice of being out on the road. We both have such different pasts in terms of our music, and I feel like we have really learned to meet in the middle and create a sound that features both of our influences equally. Monko has definitely helped me to feel free to get a little more gritty in both my singing and playing. Michael Monko: My musical past included a lot of raucous and loud rock music, as I was a bassist for a heavy rock band in San Francisco. So this project is bit different. But, I think it’s more true to a style that I can immerse myself in. Working with Gwyneth is easy. We have a similar creative thought process and agree on most everything. I can feel free to bring anything to the table. The result is something that we are both proud of. Gwyneth’s talent is beyond any I ever thought I’d be involved in. I’m truly excited and honored to share in this with her. There seems to be a resurgence of Americana music in recent years. Why do you think the music has been so successful in appealing to younger generations? G.M. : I think the younger generation is seeking a link to a confusing and complicated history, and modern Americana music is a kind of link to the past that we can grasp onto. The lyrical themes of the old songs are still something we can identify with today: work, travel, love, betrayal, death and God. The Americana genre to me is an all-encompassing group of music that pulls from these age-old themes and with a lot of the same instrumentation of the old days gives us something fresh and somewhat dark. I know for me, there is something really appealing about this, and it feels good to keep the old tradition of American Roots music alive while putting our own twist on it. M.M. : I agree with Gwyneth. I also believe that as technology progresses with MIDI and digital recording and electronic music (which I am fan of all those things) there is a desire to experience something more tangible. Real instruments played and expressed with real human qualities. Something that is embedded in those old songs. It’s like you can really feel the emotion more intimately. That’s how it is for me, anyway. Are there any different types of projects you would like to try someday, either together or independently? M.M. : I’d like to continue to evolve with this project. Gwyneth and I have a love for all types of music and I don’t think we purposefully confine ourselves to any particular genre. We just kind of do what comes out. I think our future projects will grow as we grow. Including different instruments or elements that capture our attention at the time. Was there anything musically you were exposed to as kids that you only embraced once you developed musically? M.M. : My father always played his polka and big band records when I was a kid. I liked the music, but didn’t understand it like I did rock. But as I grew older and started to play I became more interested. Classical, Big Band/swing – I love listening to all of it. Music is all good to me. Are there any experiences you have both had had that made their way onto the album? Please give an example each. G.M. 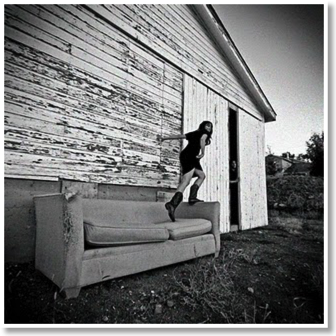 : The first track “Found In Benson” is based on real experience we had last winter on the road in Omaha. There is a blooming artist community in Omaha in an old neighborhood called Benson that we have spent some time in. The song speaks for itself, and is a true story. Also, “Consumption” is a song I wrote about my grandfathers who both suffered from Tuberculosis (I never met either one of them). M.M. : A very deeply moving song “Down” I think is something that both Gwyneth and I have experienced independently and can share in the emotion. The lyrics are dark, but they speak of a very powerful emotion that I think it is important to acknowledge. Depression is something that affects many, many people and it can feel overwhelming. I think, to be aware of what’s going on inside your mind is the best way out. Which comes first, the lyrics or the melody? G.M. : It really happens both ways. How has growing up in California contributed to your music? G.M. : I grew up in a very musical family and a very artsy small town in Northern California where music and self-expression was always encouraged. I feel like growing up in this kind of environment really played a big part in getting me where I am today. My parents both moved here from other parts of the country, and I think that has also been a great influence on my music. I have always enjoyed hearing stories of the Midwest farm that my mother grew up in and the stories of a Northwest city from my father. California is a melting pot for sure, and I think that is a good place for art to bloom. M.M. : California is so diverse with people, climate and geography that it’s hard not to be influenced by all of it. If you both could play a “fantasy show” with any one musician, who would you pick? M.M. : Neil Young. Before I die, I hope. What current music are you both listening to now? Any other up-and-coming artists? G.M. : Laura Meyer’s new album “Been Here Before” is on repeat in my car player right now. She is an awesome blues guitar player and singer from New York that we have had the pleasure of playing with a few times around the country. What are your future goals for your next music project? G.M. : I look forward to having a nice chunk of time blocked off from tour so that we can really explore the new songs we have been writing on the road. M.M. : Yeah, a little more time to explore. But, there’s nothing like a deadline, right?